Great ideas for organizing, Danielle! With my extensive collection of teddy bears and things, one shelf at a time is the only way that works for me. To do everything at once is daunting and impossible! You sound super organized! 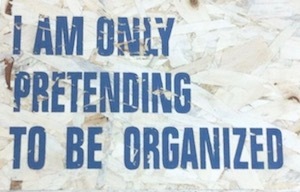 As for me, I just pretend I’m organized. 😉 Found this in a local shop, it’s a storage box.